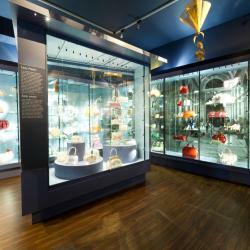 Looking for hotels near Hollandsche Schouwburg? Artist Plantage Suite in Amsterdam offers accommodations with free WiFi, less than 0.6 mi from Dutch National Opera & Ballet. The accommodations is 1.2 mi from Basilica of St. Nicholas. Set in a traditional Amsterdam mansion, Canalhouse Inn is a 15-minute walk from Amsterdam Central Railway Station. It offers 2 compact, modern style rooms with a flat-screen TV and free Wi-Fi. Offering free WiFi, Hide&Sleep is set in Amsterdam. A flat-screen TV with cable channels, as well as an iPod docking station are available. The room features a seating area for your convenience. Stout & Co is located in the center of Amsterdam at 1.2 mi from Central Station. 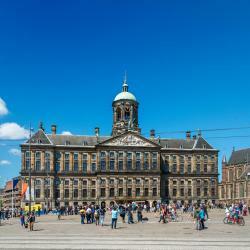 The popular Nieuwmarkt and Rembrandtplein are both 0.9 mi away. 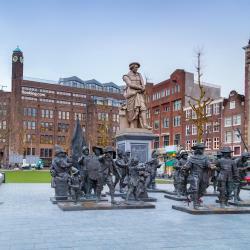 Located within a 6-minute walk of Rembrandt House and 600 yards of Dutch National Opera & Ballet, Motel One Amsterdam-Waterlooplein in Amsterdam provides a bar and rooms with free WiFi. 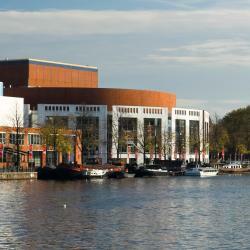 Wittenberg is a monumental short stay building, offering modern accommodations in Amsterdam's residential area. It features a Smart HD TV. Located in the characteristic canal district, Luxury Suites Amsterdam only offers spacious 5-star suites with bathrooms of 10 to 20 square yards. Best part was the staff. Very helpful and nice. Never seen better in my past 20 years of traveling. 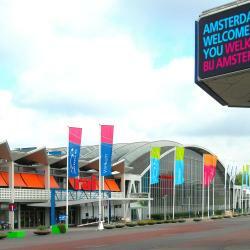 Located in the Oosterpark, Hotel Arena is located in the upcoming eastern part of Amsterdam. Guests can enjoy food and drinks with a view at café- restaurant PARK. Amazing and eclectic hotel. Good location, nice restaurant and fashionable details. Hotelboat Allure offers rooms with free Wi-Fi on the Oosterdock, just over a 10-minute walk from Amsterdam Central Railway Station. Friendly,cosy in the middle of Amsterdam yet quite. De Jonker Urban Studios & Suites is a self-service property, without on-site staff, offering rooms in a monumental building in Amsterdam East, facing Artis Zoo. Taking a gamble on a newly refurbished and unreviued hotel paid off. Offering a sun terrace, The Cabin @ MPS Noorderzon is a floating boutique B&B set in the canals of Amsterdam. Dave and Anne, the owner/operators were fantastic! 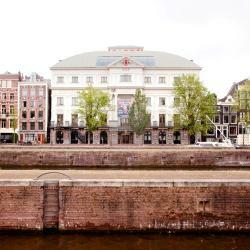 Hotels with great access to Hollandsche Schouwburg! The Lancaster Hotel Amsterdam is located in a charming Amsterdam town house in the greenest part of the city center and opposite Artis Zoo. Beautiful hotel! Super close to the tram. In the greenest area of Amsterdam's city center, this 3-star hotel offers modern guest rooms in an authentic residence. Just far enough away from any late night noise. Great location for walkers or bike riders. Hotel Hortus provides budget accommodations featuring nonsmoking rooms for up to 6 people, located in the east side of the City Center, behind the Botanical Gardens. Everything was excellent. Great price, great room, kitchen and stuff. The breakfast was excellent. Barbacan provides simply furnished rooms in Amsterdam, only a 5-minute walk from Artis Zoo. This budget hotel features a 24-hour front desk and free Wi-Fi throughout the hotel. Great location and price/quality relation.